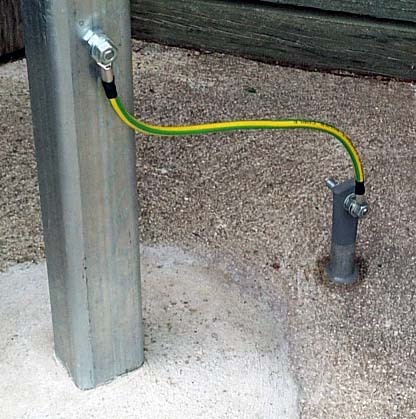 This article describes the earthing system installed at VK1OD. part of an RF radiating system. The analysis presented here is for reduction of the risk of effects of lightning, and does not consider performance of the earthing system as part of an antenna. to maintain the proper working of the electrical distribution system. Whilst not essential to operation, one wire of power distributions is usually earthed, especially where line length exceeds hundreds of metres. The earth system is designed to protect persons and property from the hazards arising from lightning discharge. Some radio antenna designs depend on an earth system as a component of the antenna system. An example is a quarter wave vertical fed between the base of the vertical and an earth system which includes buried radials to reduce losses in the earth system and to stabilise feed point impedance. An earth electrode takes the form of a rod, strip, tube or plate which is buried in the ground, and which serves to conduct current to the general mass of earth. Earth systems that are intended to form part of an RF radiating system (antenna) have different requirements to a protective earth system of a power distribution system or earthing for lightning discharge. For example, High frequency performance is important to RF earths, but ability to withstand extreme currents for a short period is very important to lightning discharge. Plate electrodes are not very commonly used, being expensive for the performance achieved. Driven electrodes perform well and are and quick and inexpensive to install in suitable ground, reaching down into conductive layers of earth. Strip electrodes in horizontal trenches are more commonly used in rocky ground but are subject to poor performance during dry spells. 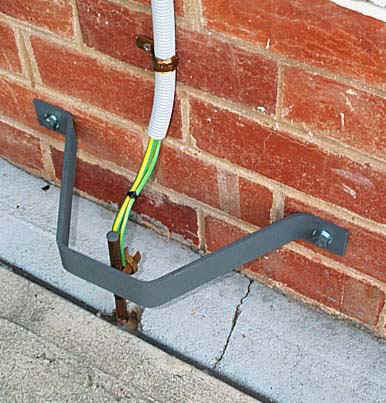 Strip (or wire) electrodes are also widely used for effective RF earthing systems. Figure 1 shows normalised electrode earth resistance for driven electrodes. The value from the Y axis is multiplied by the soil resistivity and divided by 100 to obtain the electrode earth resistance. For example, a 2.6m deep, 15mm diameter electrode in soil with resistivity 30 ohm metres would be 38 * 30 / 100 or 11.4 ohms. Conversely, a 2.4m deep 12mm electrode measures 8.6 ohms, soil resistivity is 8.6 / 42 * 100 or 20 ohm metres. Figure 1 assumes homogenous earth, but in a practical situation soil resistivity varies with depth. Resistivity may vary from ten or so ohm-metres for highly conductive ground to several hundred ohm-metres for dry non-conductive rock. Earth electrodes are commonly driven into earth with resistivity of 20 to 70 ohm-metres. Note that earth is also described using earth conductivity which is expressed in siemens/metre and is the inverse of the earth resistivity figure. Driven electrodes can be a low cost and effective way of accessing conductive mass of earth. The resistance of driven electrodes in homogenous earth decreases very rapidly with depth until around 1m, and by about 3m the rate of decrease has diminished. Figure 1 shows variation in electrode earth resistance with depth in homogenous earth for a range of electrode diameters. Resistance depends on the resistivity of the soil which is affected by soil composition, structure, chemical content and moisture. Electrodes are most effective if they can be driven into moist clay. Although Figure 1 might indicate that the reduction in resistance for electrodes driven more than 1m is slow, in a practical situation it is highly likely that the upper layers of soil may be higher resistivity (drier), and that electrodes need to be driven below 2m to reach lower resistivity earth. My experience is that even where clay is accessible very close the to surface, it is subject to drying during long dry spells. Electrodes of less than 2.4m depth are much more likely to exhibit large seasonal variation in earth resistance. The NSW Electricity Commission documented performance of various types of earth electrodes at a range of locations around NSW. One of the interesting observations was that measured earth resistance of galvanised electrodes at some locations was significantly higher than predicted, whereas copper clad steel electrodes were more consistent. Experiments with the shape of the electrodes (galvanised star pickets / galvanised pipe) did not explain the effect. I drove a 2.4m length of 20mm NB galvanised water pipe as an experiment, and compared its earth resistance over a period of time with a nearby 12.7mm copper clad steel electrode of the same depth. The galvanised electrode always measured significantly higher than the copper clad electrode, commonly 200% to 300%. For example, a 0.2m deep, 12mm diameter electrode of length 5m in soil with resistivity 30 ohm metres would be 28 * 30 / 100 or 8.4 ohms. Conversely, a 0.1m deep 12mm electrode of 2m length measures 15.0 ohms, soil resistivity is 15.0 / 60 * 100 or 25 ohm-metres. Figure 2a shows the normalised resistance of a set of 3mm diameter radials at a depth of 0.1m. Note that there is not much benefit in more than 6 radials. Figures 2 and 2a assume homogenous earth, but in a practical situation soil resistivity varies. Resistivity may vary from ten or so ohm-metres for highly conductive ground to several hundred ohm-metres for dry non-conductive rock. Resistance increases slowly with increased depth of burial, however shallow burial is prone to variation in resistance caused by seasonal changes in soil moisture content. Resistance is a function of the electrode diameter, but it is not very sensitive to increased diameter. Isolated earth electrodes may develop significant potential differences under influence of high currents, such as might be experience in power distribution fault conditions, or particularly during lightning discharge. Where these electrodes connect to different parts of an installation, the potential difference may inject currents that are disruptive or damaging. For this reason, earth electrodes are commonly bonded by low impedance (low resistance, low inductance) conductors that will withstand the extreme currents that may flow for a short period. Some power supplies commonly employed in amateur radio stations convert the AC power supply to an 12V DC supply that is isolated from the chassis of the power supply, which itself may or may not be earthed. Do not assume that the power supply provides an effective earth path from the transceiver chassis to the power supply earth. The earth system has to be considered as an integrated system, telecommunications earth cannot be considered independently of say, the power distribution earth because more than one of the various earth systems will be connected to some equipment thereby creating current paths that might not have been planned, might not be adequate, or might not remain continuous. The distribution system at VK1OD uses the Multiple Earth Neutral (MEN) system of earthing. In the MEN system, the neutral conductor furnishes a low impedance return path for current and its potential is kept near to earth potential by a sufficient number of earth electrode connections throughout its length. The neutral conductor is bonded to an earth electrode at the main switchboard of every consumer installation. The consumer mains at this site is a four wire, three phase 16 sq mm mains rated (at installation) at 80A per phase. When the premises were constructed the practice was to use the copper water supply main as the earth electrode (connected by about 10m of 4 sq mm copper conductor). At last change to the installation, regulatory requirements were met by an earth electrode of 12mm diameter copper clad steel 1.2m depth, connected to the neutral link on the main switchboard by 5m of 6 sq mm copper conductor. The water pipe connection is still in place and effective (at low frequencies anyway). Measurements of the earth resistance of the 1.2m electrode approach 100 ohms after prolonged dry spells, so an extension of 1.4m was joined using a brass coupler and the combination driven to a depth of 2.6m, which at the time of driving reduced earth resistance from 75 ohms to 24 ohms. Later measurements after a rainy period indicated a electrode earth resistance of 11 ohms. Incoming aerial telephone lines are passed through surge suppressors that contain LC filtering, MOV and gas arrestors. The telecommunications earth (backplane of the MDF) is bonded to the main earth with 10m of 6 sq mm copper conductor. Radio antenna masts are protected by a 12mm copper clad earth electrode driven 2.4 to 2.8m into the earth. Mast structures are bonded to the electrodes using copper conductors of at least 25 sq mm. Electrodes and structures are equi-potential bonded. No attempt has been made to suppress differential surges on the coaxial cables. The antennas are left disconnected when not in use, and are not used during electrical storms. The only treatment afforded to antennas has been to ensure that the coaxial cable outer conductor is adequately bonded to an earth conductor at the antenna patch panel. No antenna system installed at VK1OD is designed to depend on the natural earth (with or without supplementation) as a functional component of the radiator system. All earth electrodes and the metallic water service are bonded to limit potential differences between the electrodes. Table 1 lists the various earth electrodes installed. Table 2 shows earth resistance of the electrodes measured the the three wire fall of potential method. Figure 3 shows the principal of the three wire fall of potential method. A current is injected between the electrode under test (E) and test electrode C, and the potential drop measured at electrode P. In practice, modern testers use AC to avoid undesirable polarity effects and usually an AC frequency well removed (800 - 900Hz) and not harmonically related from mains frequency combined with synchronous detection to avoid inaccuracies due to mains currents flowing in the earth mass. Soil type is yellow/brown clay under topsoil of about 200mm depth. Note the variation in the measured resistances of electrodes 3 and 4 which are driven within 0.5 metres of each other. The resistance of the galvanised steel electrode is higher than expected. Figure 4 is a summary of the first 7 data columns of Table 2. It shows that the resistance of the copper clad electrode is more consistent and the median is much lower than the galvalised electrode. 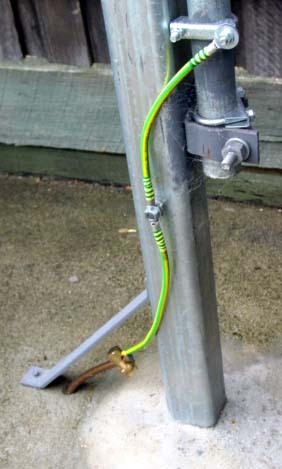 There is a popularity in amateur radio stations to install an earth electrode system that is primarily intended to form a component of an antenna system. The belief is that shallow burial of a radial patterns of relatively thin wire (3 sq mm or less) is effective, and that insulation of conductors does not inhibit performance, indeed it is argued to reduce corrosion and so extend the life of the system. This practice may provide a 'virtual' earth forming part of an antenna system, but the shallow burial makes performance for power or lightning earthing variable dependent on weather. Insulation of the conductors prevents them being effective at low frequencies. These earth electrode system often have low current sustaining capability due to combination of thin wire and lack of maintenance of aggregate cross sectional areas as wires are paralleled at the point of connection of multiple conductors. These systems often could not handle power distribution fault currents, much less lightning discharge currents. Driven electrodes need to access conductive layers of soil. Soil nearest the surface is most subject to drying out after long dry spells, dramatically degrading performance of shall driven electrodes. Electrodes driven to less than about 2.4m are prone to high resistance and variable performance. Electrodes of dissimilar electrodes that are connected to provide a current path for galvanic currents. Such currents accelerate corrosion of at least one of the electrodes.